You see them often but perhaps you don’t acknowledge what they’re used for or just how practical they are – prefabricated steel buildings are everywhere, and we at Panel Built Incorporated know just how useful they are. At Panel Built, we pride ourselves on helping our customers find creative solutions for their building and storage needs, and prefabricated steel buildings are a large part of that. Maybe you’re unsure of what they are, why metal is the best, or you’re unsure of where to buy pre-engineered steel buildings. First and foremost, a prefabricated steel building is a cost effective alternative method to standard construction. The Panel Built prefabricated buildings offer outstanding quality, durability, and aesthetic choices to fit any need. 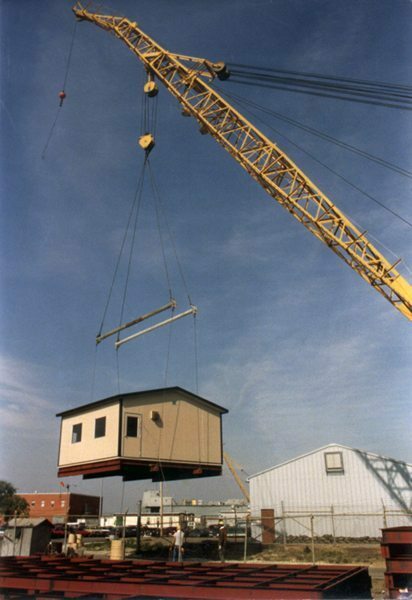 The buildings are expandable and relocatable, making them one of the most flexible options to allow for future growth and mobility. We find that metal is the best material to use for these houses… why? Crafting our buildings of steel helps keeps the cost down for you initially, as well as in the long run. Steel is extremely durable and easy to maintain, so regular maintenance will be minimal. Steel structures are extremely strong, and erosion is not likely, even over years of use. Other problems that often accompany brick and mortar or other materials? Termites, pests, cracks, and fires. Each of these annoyances exist minimally when you choose a steel pre-fabricated building. So, now that you have a great understanding of what the Panel Built pre-fabricated steel building is and why it’s a great choice, what might you use one for? Contractors, project managers, and workers find that they traverse from the job site to the office far too much during the life of a job. If you ask them, there’s an absurd number of hours spent in the truck on the road that could be spent doing actual work. Our solution? A prefabricated steel building is a great choice for an on-site office. Consider a construction site, where there’s a number of contractors, sub-contractors, workers and project managers that come together every day. An on-site office will give them a central location to meet, to talk, to plan, and to assess productivity, as opposed to doing it with a hard-hat on outside on site or at an inconvenient location for the majority. Our country is dotted with military bases, every single one full of valuable personnel and military assets; some containing classified information and dangerous weapons. Never has a thick layer of security been more necessary than on a military base. 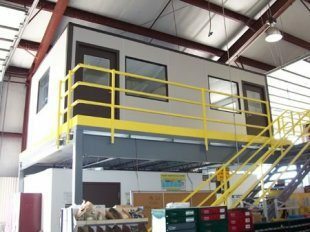 Panel Built’s prefabricated steel buildings can be customized to meet any need, and with any customization comes the guarantee that each building will be up to code meeting military, construction and OSHA regulations. With military personnel present at base entry in a Panel Built steel building, those on base can rest assured that only qualified personnel will gain entry. Resources and people will remain safe, as entry and exit of the base is tracked consistently. Construction sites are often set over the course of months or years. During that time, there’s very rarely any opportunity to “clean up”, where resources are put away for safe keeping. This means that, at a bare minimum, hundreds of thousands of dollars worth of construction equipment can be found on site, unoccupied, at any given time. This would invite crime were it not for the prudent project manager who thought a pre-fabricated steel building a good investment for his construction site. Placed on the outskirts of the site, perhaps near a modular office, a security office will gate and monitor every vehicle or person that comes on site. Perhaps a guard will need to see a badge of some sort, or a tag on a vehicle. In addition, a security guard who sets up shop in the guard house at night can watch to ensure that no resource is tampered with while left unoccupied. With a relatively minimal investment, thousands of dollars may be protected with the modular building for security on the outskirts of a construction site. A gated community feels secure, does it not? There’s something about buying or renting in a community where a guard is at watch all day and all night; where every visitor in and out is tracked at the guard house. This is particularly helpful in areas that aren’t considered to be as safe as others, or have previously been compromised by criminal activity consistently. It’s not just a danger preventative though; for some, it’s simply an added luxury. If the area is already safe and remotely middle-high end, there’s a feeling of privilege upon entry, a feeling of belonging. Nearly every community could stand to add a gated security office at its entrance. For a minimal cost, adding a security office will allow community members an added feeling of security, and of privilege. Instantly, the gated community properties become more appealing and value increases – all because somebody decided to purchase an exterior prefabricated modular building for use as a guard house, with a security guard residing inside to track visitors, and supervise entry and exit. Need a little storage space in your facility? Put a pre-fabricated steel building on top of a structural mezzanine and you’ve just significantly increased your square footage and solved your storage conundrum. Temperature controlled buildings ensure your valuable items are safe and in a healthy environment, and keeping them under lock and key will give you peace of mind, as well. Bottom line? There are numerous ways to use a pre-fabricated steel building. Can you think of one way for your business? If so, don’t hesitate to give us a call at Panel Built Incorporated. We’re happy to answer your questions and create a customized solution for any need.